Tall trees surrounded the still geothermal waters of Lake Hévíz. I paddled around the lily pads, hoping the minerals would soak away my strains. Hévíz was a brief stop between my second Slovenian match in Krško and Hungarian match in Felcsút. It refreshed memories of the Reykjavík baths of Laugardalslaug in July. I was looking forward then, now I’m looking back. Iceland was my second football nation. I had watched one match in Georgia, seen two goals and met a handful of football people. I was nearly overwhelmed when the 43 winter leagues published their schedules later last summer. I actually quite loved the logistics. 55 Football Nations was one big puzzle. A colleague offered to write me a computer program that would work out the best route. There were lots of knowns and unknowns. But intuition and chasing a football story also played a part that software could not emulate. This was my challenge. I wanted to visit Mariehamn, Trabzonspor and Crotone from the very beginning. They met my expectations in different ways. I will stay in over 100 places, some as obscure as Taraz, Esch and Kruševac. I have booked 54 flights and nearly broke a search engine trying to get from San Marino to Luxembourg in one day. Now, with just seven matches left in Hungary, Croatia, a third match in Slovenia, Bosnia-Herzegovina and the finale in Montenegro, I can reflect on life without 55 Football Nations. I was going to miss the football more than the planning. I’ve integrated myself into many of the clubs and towns I’ve visited. Most recently, I met Darko Miličić, the NK Maribor manager, and Zoran Omerzu, the NK Krško president, in Slovenia. It’s hard not to be affected by their passion. And love some of the idiosyncrasies of football. Krško, better known for its Speedway track, nuclear power station and wine production, is so proud of its top division status. I watched their match against league leaders Olimpija Ljubljana with four Danish anthropology students researching football culture. Krško was blessed with strange foreign visitors they would not have attracted in their lower league days. I loved this randomness. Krško lapped up the attention. 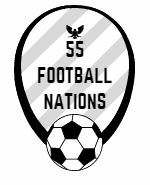 55 Football Nations was my own idea. I thought it was a good one, a travel challenge with a football beat. So did the media, with over 70 appearances. The press turned the story in different ways. My football comments were mostly ignored in Maribor but my praise for the local wines and pork and horseradish sandwiches were gold dust for the television cameras. “Isn’t all this PR stressful?” asked one follower of my travels. It opened doors in countries where the language barrier prevented me from speaking to fans and clubs. I was entertained that I remained 40 years old well past my birthday as hacks rehashed old stories and promoted eternal life. I could never be a journalist. I’m too accurate. The days between the matches have always been the hardest. Great cities like Stockholm, Moscow and Istanbul were mere expensive junctions for my journey. I joked to a Swiss journalist that I had seen enough cathedrals and old towns. My travel tastes have been sharpened. I needed places to have an angle to interest me. I knew little about Pécs in southern Hungary. The beautiful Zsolnay tiles made the city special. I hate bad weather. “Why have you visited Denmark in December?” asked a Helsingør fan. I had to go somewhere; Poland was even colder. I had snow in Scotland and warmed up in a petrol station during half-time in Andorra. But my biggest fear was the Czech Republic to Liechtenstein leg in the middle of March. I clock watched through the last few minutes of Vaduz against Schaffhausen, the game as dead as the weather, and hoped this would be the end of the big coat. It nearly was. The sun shined on Slovenia. I could wear my Taiwanese cat t-shirts again. The dark months have been hard on the diet. Bad burgers and poor pizza have bred across Europe. There have been highlights – the delicious food in San Marino, Andalusian delicacies, majestic Middle Eastern fare in Israel – but a lot of rubbish. I felt sorry for the Hungarian policeman who breathalysed me after a double bacon burger and a kebab. The gorgeous fresh salads of Georgia and Turkey seemed like distant dreams. I ate tortilla chips and a hotel chocolate for dinner in Luxembourg. I was looking forward to not eating alone. Or in restaurants. I worried about continuity. I would be there, but I was not going to meet the same people or experience the same places. My social network helped. People, strangers, friends, followed my travels and sent me messages throughout my trip. They framed my journey across Europe. I would certainly visit some of them in the future. Will I miss 55 Football Nations? I would not wish three Ryanair flights in four days on anyone with my lofty frame. At times, I’ve felt like I’ve been on 55 European city breaks. Some places I will go back to. I doubt I will ever return to the remote Russian city of Ufa. But I will miss the passion, the stadiums, the people, the crazy goals, the ridiculous 320 minutes without a goal. There’s a book to be written. And surely another challenge to be undertaken. A reflection piece that hits the middle ground. I would never make it as a journalist. Thanks for these reflections. I think the 320-minute goal drought definitely deserves a bit more examination in your book. Not sure of the angle, though. Maybe link it with the passion: why do we get so passionate about, and try and create meaning around, a sport where there may only be one moment of drama in almost two hours of action, which decides the outcome? And how do we process a 0-0 draw? I often feel like I’m losing the will to live when I sit through them (I’ve sat through two in 2017-18, out of five matches attended! ), and yet we still keep coming back for more, and most of us sit through the full 90 minutes+ on the day, even though it’s usually apparent by about 55 minutes that a goal is very unlikely to be coming (in my experience!). Why? I know it sounds depressing but there is probably an uplifting narrative in there somewhere, and maybe you will be the one to find it!